Through the Mental Health Act 2007 the government updated the 1983 Act to keep pace with changes in the way services were and needed to be delivered. One major change was in relation to clinical and forensic psychologists. The Responsible Medical Officer was replaced with the Responsible Clinician of which clinical and forensic psychologists could be approved to be. During my time at the Department of Health as a member of the Mental Health Act Implementation Advisory Group I supported this change. I also consulted with the profession on this and felt it was widely supported. The changes were made, and since the Act became law in 2007 a working group has continued to meet to ensure these changes were brought into being. I have been kept informed of the work of the group, which has included developing mechanisms for approval and training programmes. It is rather disappointing five years later to see that the latest figures show that only five approvals have been made in England and two in Wales for psychologists. Approvals for other professions have not fared any better. Across England and Wales there were seven nurse approvals, one social worker approval and no occupational therapist approvals at all. I am only left wondering why. Perhaps it is time to have some discussion and debate on this. I read today that by 2014 physiotherapists and podiatrists will gain prescribing powers such that they can prescribe painkillers and anti-inflammatories to their patients without the need for them to return to a medic simply for the prescription. This seems a sensible development, and I wonder why it is that psychologists have not long since done the same. Of course there are complexities around psychopharmacology and mental distress, but to have the option available to psychologists after adequate training, especially those of us who work with marked distress, would seem to be of clear benefit. This led me to wonder what the BPS has done regarding this? I wonder also why the BPS, during the Agenda for Change reorganisation of the NHS, allowed us to be ranked with speech therapists (who require a three-year degree course to practise) and not alongside medical practitioners (who, similar to applied psychologists, require six years to qualify before gaining the title ‘doctor’). We might also have been positioned outside of the Agenda for Change structure – again in a manner similar to the medics. Similarly, I wonder why in the recent UK government’s Health and Social Care Act 2012 both nurses and medics are able to form consortia for the provision of healthcare services, but psychologists are not. Once again we seem to be the poor relation. My impression is that, outside the profession the view of practitioner psychologists increasingly does not reflect the complex role of the scientist-practitioner that psychologists actually undertake. 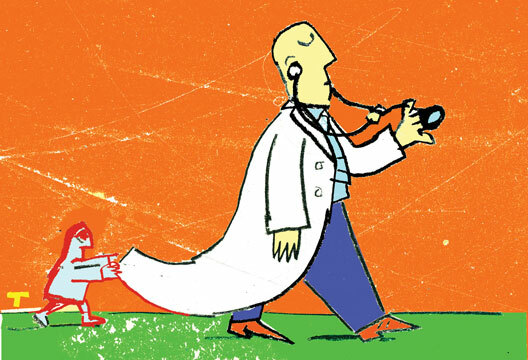 The unfortunate thing is that this impression of psychologists appears to be growing within the profession also – certainly many psychologists I have spoken to use ‘doctor’ to refer to medics only and consider themselves to be secondary to them. I wonder if it is this lack of a truly professional, vocational identity as psychologists that our Society is reflecting when negotiating our secondary position in the situations detailed above. I am writing as a teacher of A-level Psychology who has read the Ofqual ‘A-level Reform Consultation’ document (tinyurl.com/bpxvfxv). I have mixed feelings about the proposals that I wanted to share with other Society members before decisions start to be voiced and inevitably become harder to influence. The document states that by 2018 all A-levels will have been changed or discontinued. Reading this was the first time I felt any worry while reading the proposals. Whilst I feel that A-level Psychology is a valid and valuable subject choice, I am not confident that the government and the public would agree. I am also not confident that universities wouldn’t prefer a blank slate when students arrive to study psychology at degree level. This nervousness, however, sits alongside a sense of excitement that we have an opportunity as a Society to make improvements. Ofqual have touched upon the fact that practical issues will need to be considered regarding the delivery and provision for the new A-levels. I feel that the quantity of qualified subject specialists to teach this subject needs to be considered as a matter of priority. The recent cut in the number of PGCE places available for training psychology teachers is an issue as it seems to signal the lack of regard the government has for this subject. The potential reform of A-level Psychology should be of concern to the BPS and all members because Psychology is one of the most popular A-level courses, and as such much of the publicity for this discipline comes from this level of study. The recruitment of tomorrow’s psychologists partly depends on presenting this subject in the right way, and the discussion needs to start early on about what the ‘right way’ might be. I Whether it is possible to avoid the duplication of Year 1 degree study and A-level Psychology to ensure that the choice to study A-level is enriching. I How the inclusion of independent or practical work can be achieved without simply bringing back the old coursework (which was removed because it lacked validity). I Educating those that teach and publicise the subject (including GCSE Science teachers) that it is the scientific approach to research in psychology as a discipline that makes it science not the inclusion of biological psychology and neuroscience content/topics. I Ensuring that it is possible to determine which candidates are more learned about psychology and the issues involved in research, rather than those who are simply better at English. I Supporting those teachers who find themselves teaching a subject that they do not have a degree in. I Investigating how the skills of a researching psychologist can be assessed as well as knowledge of psychological theory and research. I would really like to hear what other Society members in all fields think about the possible reform of A-Level Psychology, as many of us, I am sure, are Society members now because of our first experiences with the subject at sixth form. The ubiquity of digital technologies, and their integration in social networking sites like Facebook and Twitter and video sharing websites such as YouTube, has provided a new impetus to their recruitment and development in scientific research. Alongside this trend, a growing body of publications continues to encourage the submission of supplementary audiovisual data. For researchers attempting to handle audiovisual data, questions quickly arise, including how to frame, analyse and represent it. These concerns have produced numerous publications, many of which have provided methodological and theoretical traction within psychology. But have we been limited by the traditional way in which academia communicates its findings? Are digital technologies yet to be fully integrated into how research findings are presented in journal articles? The mediums through which we communicate are becoming increasing digital and interactive, as publishers strive to turn psychological texts into ebooks (book-length publication in digital forms) and the online journal continues to establish itself as the way to publish research. This increasingly digital world provides an opportunity to re-examine how research findings come to be represented. Embracing digital technologies across our discipline has yielded numerous methodological innovations and stimulated new ways to represent the rich, multimodal and multiperspective features of social interactions. Obviously, audiovisual data generated by such innovations is interpreted, analysed and represented according to the author’s epistemological and ontological positions. The way empiricists code, analyse and report the use of audiovisual data is clearly juxtaposed to how constructionists produce transcripts to represent the subtle nuances and, in some cases, the multimodal nature of social interactions. The analytical orientation of both is in many ways the antithesis of the other; yet when moving to consider how each is constrained when they come to represent their work for academic publication, similarities begin to emerge. Both have to represent the richness of their research, selecting from static graphs, figures or transcripts. It can be argued that a well-presented table, chart or transcript is, to a skilled researcher, like a piece of sheet music is to a skilled musician. However, what if we could enhance this experience? What if we could begin to include interactive graphical representations that demonstrate how theoretical models of behaviour or visual perception work? What if researchers could include a brief extract of audiovisual footage in the publication itself to illustrate the richness of non-verbal or indeed verbal communication? While such questions may challenge conventional ways of reporting research, the possibilities created encourage greater analytical rigour and dialogue between researchers, as well as offering the potential to amplify impact. Publishers are experimenting with enhanced formats including text and figures alongside multimedia content. If psychology can use these tools, then our sheet music may be heard much more loudly and clearly than before. Here in America, I recently had the opportunity to read the Good Practice Guidelines on the Use of Psychological Formulation issued by the Division of Clinical Psychology (2011). Section 4 of these guidelines provides a historical context that identifies ‘Influential clinicians such as Hans Eysenck, Victor Meyer, Monte Shapiro and Ira Turkat…’ (p.4) who helped to shape the development of psychological formulation of presenting phenomena. As the only living ‘influential clinician’ identified, I would like to take this opportunity to share my reactions. First and foremost, the Society deserves praise for articulating psychological formulation as a core skill of the profession of clinical psychology and for guidelines aimed at a ‘best practice’ standard. For decades, I stood dumbfounded at how little attention case formulation received, especially in America. It always seemed so obvious to me that difficult matters require top-quality analysis and creative thinking to generate proper resolutions, whether one is dealing with a psychological problem, a legal dispute, an archaeological enigma or any other field that faces complexities. To ignore case formulation is to ignore the very heart of a matter. At a personal level, I am deeply honoured to be identified with some of the most outstanding psychologists in the world, and frankly, am stunned to find my name uttered in the same breath. I never met Hans Eysenck or M.B. Shapiro, but the latter was kind enough to exchange correspondence with me and had an important impact upon my thinking. I very much appreciated his willingness to spend time toward the end of his career critiquing my ideas, at my invitation. One time, shortly after receiving one of his critiques, he quickly followed up with a letter expressing concern that he might have been too critical. He wasn’t; he was spot on. I will always remember and appreciate how thoughtful and selfless he was toward me. In regard to Shapiro’s own work, his approach to applying the experimental method to the individual clinical case was not just innovative at the time but literally brilliant, and in this sense – Monte Shapiro was my hero. While widely appreciated in the UK, he was and remains quite underappreciated in America, even though his work had a major impact in bringing a scientific approach to the clinical case. Most of my American colleagues would be unable to spontaneously identify M.B. Shapiro’s contributions (let alone know who he was), but fortunately, they benefit from his pioneering efforts. I was most grateful to have spent a year with Vic Meyer at the Middlesex, the most fascinating interviewer I have ever seen. His interviews were so informative and entertaining that he travelled the world interviewing patients in front of audiences as a way to teach his approach to case formulation. He was that good. And from around the world they came to London as well, to watch him take apart, understand, and then innovate a course of remediation for a difficult case. After developing his own formulation, Vic would open the floor for questions and danced skilfully with each. He encouraged competing hypotheses for discussion but they were typically shot down easily with case evidence, and usually, in the most charming way. Yet, when a creative, on-target idea emerged that had not occurred to Vic, his face would light up, he would enthusiastically explore it and excitedly help develop it further. For in the end, the goal was to provide a proper course for the patient’s well-being, and treatment could only proceed on the basis of the case formulation that best fit the data. Victor Meyer was truly remarkable, and I will always cherish our work together. I do not know the authors of the Good Practice Guidelines but we are of similar mind that there is no monopoly over the definition of case formulation (Turkat, in press). Likewise, their presentation of key components integral to a psychological formulation incorporates a good dose of the criteria that Vic Meyer and I proposed and utilised over three decades ago (Meyer & Turkat, 1979; Turkat & Meyer, 1982). I am confident that Vic would be pleased to know that his work has survived the test of time. The present ‘influential clinician’ looks forward to the day when the process, content and consequences of case formulation become an everyday topic of systematic scientific research across a wide range of difficulties. At that point, we will likely be equipped to offer solutions we cannot imagine properly today. Meyer, V. & Turkat, I.D. (1979). Behavioral analysis of clinical cases. Journal of Behavioral Assessment, 1, 259–270. Turkat, I.D. (in press). Settlement defiant litigants in matrimonial disputes. American Journal of Family Law. Turkat, I.D. & Meyer, V. (1982). The behavior-analytic approach. In P. Wachtel (Ed.) Resistance: Psychodynamic and behavioral approaches (pp.157–184). New York: Plenum. Professor Joan Freeman (Letters, September 2012) comments that there is little understanding among psychologists about what to do to change human behaviour in the face of the threats posed by climate change. A first step for The Psychologist could be to maintain a regular column highlighting whatever is happening in the field of environmental psychology. This would help to stop the neglect of these issues and keep them where they need to be – at the top of every agenda. Editor’s note: I think this is an excellent suggestion, and I will implement it via an occasional ‘Forum’ guest column from an environmental psychologist. I write to express my concerns regarding unpaid internships and their impact on the NHS. As far as I was aware, a key principle of our economic system is that you get what you pay for: things that are high in quality generally cost more. Indeed, isn’t that how we as psychologists justified our relative high banding on the NHS Agenda for Change pay scale? not been deemed important enough to warrant payment. Two questions arise from this: If it is not worth anything, why is the NHS spending the time of a salaried employee in organising and supervising the work? Conversely, if the NHS has not decided the work is of sufficient importance to spend money on, why should it get the benefits of all the hours resulting from it? The situation feels hypocritical at best. At worst, it means services hinging on the hard work of unpaid interns rest on a very shaky foundation. No salary means volunteers have no rights – and no responsibilities, meaning they can leave when they want and refuse to do things, regardless of the impact on the service left behind. Similarly, no salary means no way of effectively managing volunteers, and their work cannot be effectively incorporated into a business plan to ensure their good work is continued. A decision needs to be made: If the NHS values the work, it needs to ‘put its money where its mouth is’ and pay the cost of the work. If it is not worth paying for, the NHS should not be wasting resources (its employees time and effortin managing volunteers, physical buildings, Criminal Records Bureau checks) in making it happen. on diversity of psychology doctorate candidates or the image of the profession: it’s about valuing the work that goes into giving our clients the brilliant service they deserve. How can we expect others to value our work if we (literally) don’t value it ourselves? I have read with great interest the letters on unpaid psychology jobs, but think an important group of potential psychologists have been left out of this debate – mature students. Having originally qualified as a teacher in 1998, I later decided the profession was not for me, and after a number of administrative roles I made the decision to venture into psychology. For the last four years I worked full time whilst completing my BSc with the Open University – it was the degree I wish I had done when I was younger and I loved every minute of it. Now a postgraduate I find myself in a position that most mature students trying to enter the field will probably empathise with. My first choice would have been clinical, counselling or neuropsychology, but I am simply not in a position to take an unpaid or even a low-paid job to gain the necessary experience. As Catherine Lilley’s letter (August) states – I cannot live on air! I would think that most mature students find themselves in a similar position with mortgages to pay and families to take care of. I have in the end chosen a master’s in occupational psychology, which at least makes the most of my experience in the corporate world, but I will still more than likely end up in a position after I finish where most of the jobs are too low paid to be possible. I do not think that most graduates, especially mature students, believe we are entitled. Rather, we find psychology as whole a closed profession that discriminates against anyone that is either not from a comfortable background or trying to enter as a mature student. This is a great shame. Those of us who are older have a great deal of life experience to contribute to the profession. Perhaps psychology as whole needs to find alternative routes, in much the same way as the teaching profession has done for those wishing to transfer from industry. Until it does this I believe it will remain the privilege of a few and the poorer for it. Sociologists must think we’re wusses. While we’re handing out questionnaires, scanning people in labs or measuring behavioural responses, our society-focused friends wade into the thick of it. One particular technique, called participant observation, involves taking part in the activities of those you want to study or accompanying them in their daily lives. For reasons never quite clear to me, this has never been a popular approach in psychology, although from reading a few of the studies, perhaps you can begin to see why. Simon Winlow was finding it difficult to study violence in the night-time economy and so decided to get himself a job as a bouncer. His work provides an exceptional insight into how doormen use and understand professional violence in clubs and pubs. This was not least because, at the risk of losing his job, Winlow was expected to muscle in when patrons became aggressive. In other words, beat people up. It’s not often that you read about a researcher beating up their research subjects but how could you do such a study without it? ‘The rights and wrongs of these issues’, his research team noted, ‘were never fully resolved’. Run-ins with the authorities are not unknown. Sociologist Mick Bloor, who himself ended up in a bar fight while studying male prostitution in Glasgow, wrote a pertinent article on research dangers. He recounts how one PhD student had been imprisoned without trial in Africa during fieldwork. one morning to find a submachine gun pointed in has face and the owner insinuating he was a military informer. Sadly, not all have come away from their experiences unscathed. The body of Ken Pryce was found washed up on a Caribbean beach after investigating criminality in Jamaica. There are some isolated examples in psychology, most notably David Rosenhan’s study ‘On being sane in insane places’, where he asked researchers to fake symptoms of mental illness to be admitted to psychiatric hospital, but we are surprisingly reticent to take an immersive approach to the people we study. Maybe we are specialists in looking in from the outside? Vaughan Bell is a clinical psychologist and academic. Share your views on this and similar cross-cultural, interdisciplinary or otherwise ‘boundary related’ issues – e-mail [email protected]. Do you know how many psychologists are being instructed as expert witnesses in the Family Courts, who they are and how to contact them? Neither does anybody else. That did not matter until now, but events have been moving fast over the last five months. Contacting expert witness psychologists in order to consult them about new standards of practice has become urgent and important. In July this year the government published Mr Justice Ryder’s Judicial Proposals for the Modernisation of Family Justice. These anticipate far-reaching reforms of the Family Justice system with far less reliance on expert reports of all kinds. The government has also published draft amendments to Part 25 (Experts and Assessors) of the Family Procedure Rules 2010 and draft Practice Directions. These amendments follow recommendations made by the Family Justice Review in its final report published in November 2011. The recommendations focused on the use of expert witness evidence in care and supervision proceedings under the Children Act 1989. The Family Justice Council is now developing standards for experts and expert reports which are expected to become part of the revised Family Procedure Rules. The new standards will apply to all expert witness reports including psychologists’ reports. There is also an intention to improve both the quality and supply of psychological expert witnesses as a result of the concern about the standards of psychological assessments (which are the most commonly instructed expert report). We believe that all psychologists who contribute to the work of the Family Courts as expert witnesses should be able to take part in the formal consultations about the new standards and subsequent work streams. The timescale is short: the final standards will be published by December. But there is a major communication problem – how to identify and make contact with those who should be consulted. The Consortium of Expert Witnesses to the Family Courts is a multi-profession group which is consulted by many official bodies including the Ministry of Justice and the Family Justice Council. The Consortium has set up a joint venture with the National Centre for Applied Psychology to create as complete a list of psychologist experts as possible in the short time available. Those who add their names to the list will receive relevant mailouts, including invitations to comment or contribute, and will be invited to any workshops and seminars on standards. No other use of the list is envisaged. We invite you to list your name by going to www.nc4ap.org.uk. Please sign up! Editor’s note: Please note that we cannot vouch for any external website, and that the Society will be conducting its own consultation process on behalf of the profession. See www.bps.org.uk/bpslegacy/cp for more details. What an odd lot, ah! The new Greater Glasgow & Clyde Assistant Psychologists' Group is looking for members. This small, friendly group is open to assistant psychologists, research assistants and other psychology graduate workers employed in non-training roles by the NHS in the Greater Glasgow & Clyde area. It meets once every couple of months for group discussion and peer support. Please contact me for more details. Academics, journalists and others are still using the word ‘commit’ in connection with suicide; yet suicide is not a sin and is no longer a crime. We even see it used by other suicidologists in specialist journals. in some religions and is often considered a moral sin today. I In the past, suicide was a criminal act in many countries. For example, there was a legal prohibition against ‘committing’ suicide in England and Wales until the Suicide Act 1961 was introduced. I In many countries, care for those with mental illness can be sought involuntarily (‘committed’). This is often the only occurrence outside of committing a crime and being held that an individual can be detained without their consent. Using the word ‘commit’ within the context of suicide is not only unnecessary, it is also harmful. Suicide is a considerable public health issue with ripple effects throughout the community. Those affected by suicide (whether personally or due to the death of a person to whom they are connected) are vulnerable and often stigmatised. We need to talk more about suicide, and provide safe places for this to occur in a manner that is helpful and healthy. However, such talk is often stuck in concepts and language from the past that perpetuate stigma, constrain thinking and reduce help-seeking behaviour. Those bereaved by suicide and those who have been suicidal themselves have commented on the negative and unhelpful effects of stigmatising language (Alberta Mental Health Board, n.d.; Maple et al., 2010; Sommer-Rotenberg, 1998). 'I have always believed language is very powerful, no matter the subject. As a person who has had a number of suicide attempts, I believe the continuing stigma surrounding suicide will make it very difficult to change the language. Consider successful suicide and failed suicide attempts, terms used regularly in ER’s and Mental Health Units. The successful suicide means you’re dead. Would anyone consider referring to any other way in which a person died as ‘successful’? My ‘failed attempts’ have, when receiving medical attention, made me feel like just that, a failure. By limiting the use of negatively associated language, and instead using language that accurately and sensitively describes experience, such as, ‘died by suicide’, or ‘ended his/her life’, we promote a healthier way in which to open conversation about risk and resilience, as well as assisting those bereaved by suicide. ‘Suicide’ is both a noun and a verb so it is also acceptable to say, ‘she suicided last year’, for example. Language takes time to change and we should be at the forefront of championing this change. This shows both respect in caring for people affected by suicide, as well as being accurate in relation to their experience.